I was feeling a bit fed up and in need of a fun, distracting, light hearted and uplifting read. I picked up ‘A Christmas Gift’ and I soon realised that this one book was going to tick all those boxes and then some. I dove straight in to the book and began to read. I absolutely loved ‘A Christmas Gift’ but more about that in a bit. I couldn’t help but warm to the character of Georgine. She sounds like a lovely young woman, who has been dealt a rotten hand of cards. She was seeing somebody but he walked out on her and left her with a lot of debt. She now has to face the consequences of failure to pay the debt and she is left trying to dodge the debt collectors who come to her door on a regular basis. I found myself wanting to jump inside the pages of the book to give her a hug and give her some advice, that I have heard from the local Citizens Advice Bureau. I know Georgine is a fictional character but I felt so sorry for her. Anyway Georgine tries not to let the debt get her down and she throws herself into her work, which she loves. She is the events organiser for ‘Acting Instrumental’. Her work brings her into contact with a handsome, dreamboat called Joe Blackthorn. Joe is hiding secrets of his very own and he soon tells his boss just what they are but will he tell Georgine? Is Georgine going to free herself from her ex-boyfriend’s debts and get the happy ever ending that she so deserves? Well for the answers to those questions and more you are just going to have to read the book for yourselves because I am not going to tell you. Oh my word, ‘A Christmas Gift’ was just the book that I needed to read and it came along at just the right time. As I indicated before, I was in need of a distracting read to distract me from the fact I was feeling fed up about the chronic back pain that I suffer with. I became so wrapped up in the story and the characters that I forgot about the pain and just focused on the book instead. The author’s writing style is such that you can’t fail to be drawn to the story and the characters. She writes about her characters so convincingly and so warmly that they seemed to come to life. I warmed to Georgine and to Joe and by the time I closed the back cover of the book, I considered them both to be friends. I soon became addicted to this book and I found that I was always in need of my next fix. If I had to put the book down, then I immediately looked forward to being able to pick it back up again. The pages seemed to fly past that quickly that it was almost as if they were turning themselves and before I knew what was happening I finished the book which I had mixed feelings about. Don’t get me wrong I was pleased to finish the book because I knew how the story ended but I was enjoying the storylines, the characters and the author’s writing style so much that I just wanted the book to continue. My only criticism is that the book had to end! I wonder if this is the last we will see of Georgine and Joe? I sincerely hope not. 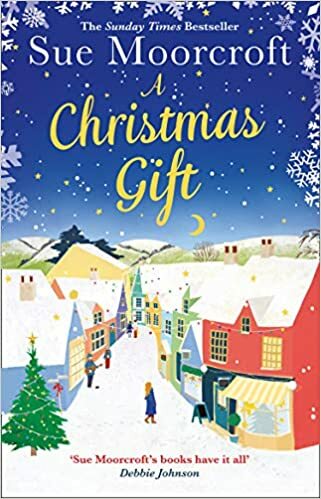 In short I absolutely ADORED reading ‘A Christmas Gift’ and I would definitely recommend it to other readers. I can’t wait to read what Sue Moorcroft comes up with next. The score on the Ginger Book Geek board is a very well deserved 5* out of 5*.